An authentic gem in the panorama of Roman and Italian accommodation facilities, the Palazzo del Duca (built in 1492) lives in the spaces that were reserved for the prestigious Teatro d’Arte Rosati, active in the Capital in the first half of the ‘900 and artistic cradle of the likes of Anna Magnani, Vittorio De Sica and Alberto Sordi. The structure keeps intact its historicity and the special atmosphere that only such a glorious past can give. 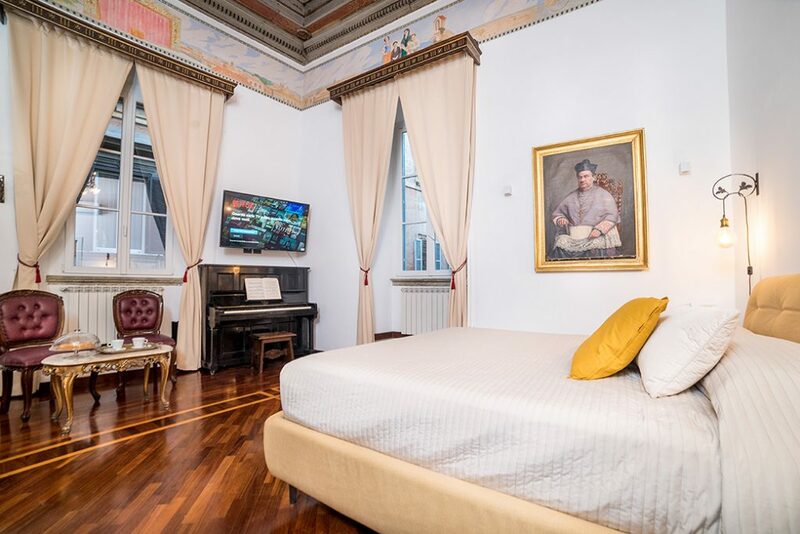 The Suite of Palazzo del Duca is an unicum in the city of Rome. It extends over 40 square meters, and keeps intact the Renaissance atmosphere of the Eternal City. Equipped with a latest generation King Size bed and an additional double bed in front of the balcony, it offers its guests maximum service and comfort. Frigobar, coffee machine, boiler to prepare tea and herbal teas and USB sockets to charge your devices, Piano, 2 windows and a French window overlooking the center of Rome, a Smart TV of the latest generation (60 inches.). The real pride of the Suite is the bathroom, spacious and equipped with a beautiful bathtub for relaxing baths and a spacious shower for shorter and more functional stops. In the bathroom, intact, the fireplace that dates back to the foundation of the Palace, 1492. Adjacent to the Suite, the living room with kitchen (20 square meters). Here we are in the Green Room of the Palazzo del Duca. Quiet, spacious and with beautiful frescoed ceilings. The Green Room keeps intact the magical historicity and atmosphere of the Palazzo del Duca and combines this with all the services and amenities that will make your stay unforgettable. Smart TV and the latest generation of beds, free wi-fi, air conditioning, heating and en suite bathroom with attractive design. And then again: mini-bar and daily cleaning service. 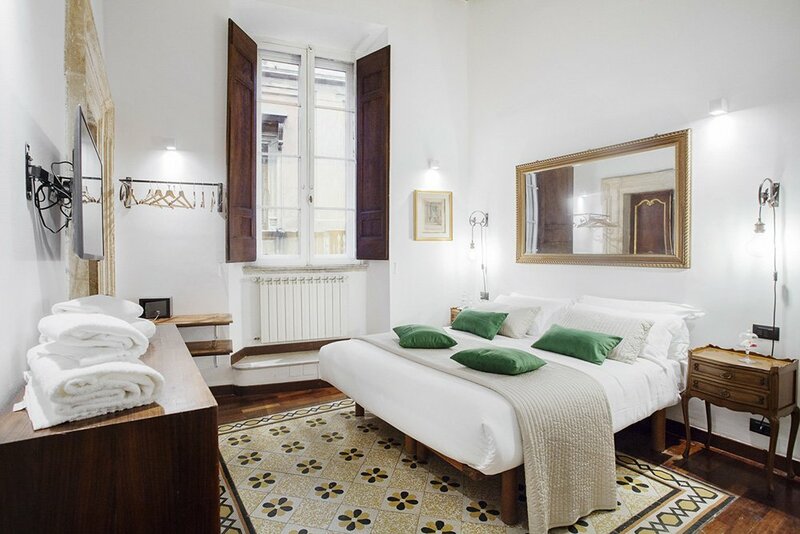 The Green Room overlooks the historic streets of the center of Rome, creating a wonderful atmosphere. 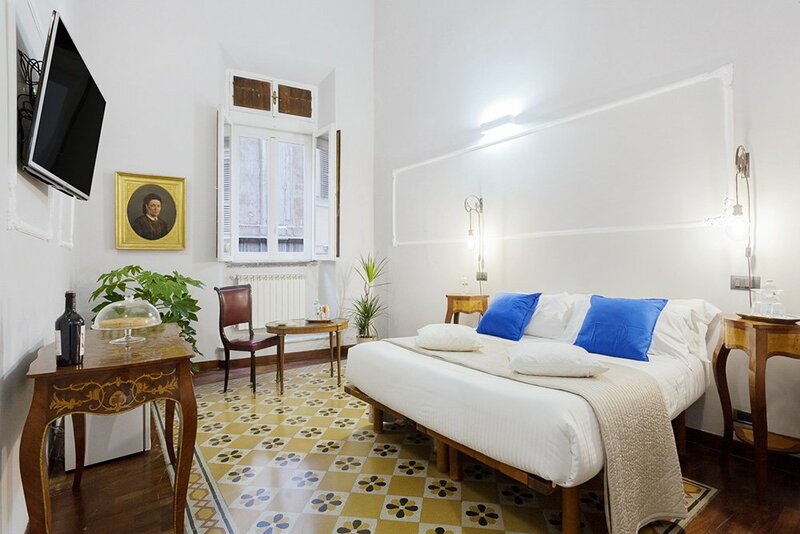 The Blue Room of the Palazzo del Duca overlooks the historic streets of the centre of Rome. It is equipped with all the comforts necessary for an unforgettable stay: welcoming and quiet environment, double bed, possibility of a comfortable extra bed, minibar, free wi-fi and Smart TV of the latest technology, suitable for all types of connection and reproduction content. The internal bathroom is spacious and functional, the daily cleaning service, as in the entire structure. In front of the Blue Room, a large comfort zone. Welcome to your unforgettable stay in Rome! Via del Governo Vecchio is located 2 minutes walk from Piazza Navona and makes accessible on foot, easily and in a few minutes, the main attractions of the capital: St. Peter’s, the Vatican, Trevi Fountain, the Altar of the Fatherland, the Pantheon, Piazza Venezia, Piazza di Spagna, Via del Corso, Castel Sant’Angelo, the Roman Forum, the Arch of Constantine, the Market of Trajan, the Sacred Area, the Ara Pacis are all near your rooms. Also the Coliseum, Baths of Caracalla, Circus Maximus and Janiculum can be reached on foot, taking 25/30 minutes on foot, or, halving the time, with the means.